EarthLite UV Hot Towel Cabinet "
Earthlite ® has developed a proprietary line of UV Hot Towel Cabinets. This Towel Warmer has been designed and engineered to produce a consistent heat range, durable construction and easy operation. 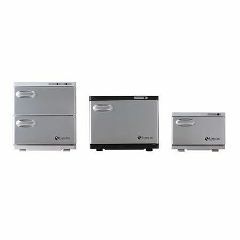 The signature silver door is surrounded with a white or black easy to clean cabinet. The Earthlite UV Hot Towel Cabinet, was created with quality in mind.